Whether you are looking at a stunning city skyline or the majestic Indian Ocean, a picturesque view elevates the experience of an already great meal. Whichever you choose, it will be the perfect accompaniment to mornings in paradise! 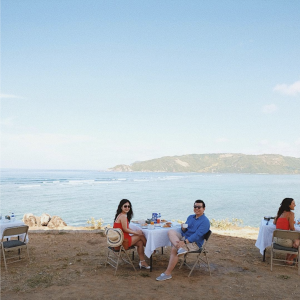 Enjoy the best of local breakfast delicacies while your senses feast on a spectacular sight. Discover 5 top places to start your day on a high note! It would be all smiles in the Land of Smiles, when the glorious skyline of the Thai capital rises to greet you every morning. Take in the bustling city through the floor-to-ceiling windows, and gaze into the distance where skyscrapers seem to dance with each other under the brilliance of sun rays. Before you know it, your morning meal of Thai rice congee and meat skewers will arrive. Indeed, it’s a view that’s impossible to beat. Oh, one would be lost when it comes to the choice of a perfect spot to start the day with! Amidst the soothing tropical gardens, with its lush greenery and exotic flora? By the charming lagoon pool with its gently lapping waters that makes a dip irresistible? Or better yet, the pristine white sands of Nusa Dua Beach, allowing you to quietly worship the awe-inspiring Indian Ocean! Whatever makes your day, mornings at Sofitel Bali is proof that on paradise island, even mealtime makes for memories that leave your heart full. Every morning here is reason to fall in love again with the Land of the Long White Cloud. Cheerily greeting you is an amazing panoramic view of Lake Wakatipu, framed against the majestic rolling mountain range of The Remarkables. 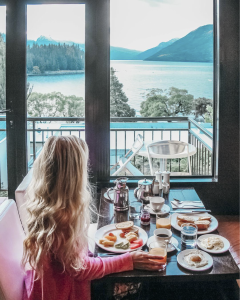 New Zealand’s longest lake never fails to mesmerize with its gently rippling waters, and the scenic alpine backdrop simply adds to its already breathtaking beauty. Add on a hearty Kiwi breakfast of scrambled eggs, bacon and hash browns, and you have a soul-satisfying start to your day! Savour a warm, bowl of delectable bubur or Indonesian porridge right before the majestic Indian Ocean. This is a front-row encounter with the sparkling white sands of nearby Kuta Beach, where sun, sea, and sand come together to compose a dreamy picture of idyllic island life. 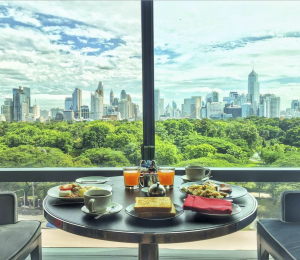 Talk about redefining breakfast with a view! How’d you like waking up to the quiet stirrings of nature? You could have breakfast where the land meets the bluest ocean and sky and towering palm trees sway in the gentle sea breeze. Time really does stand still while you take in the sights and sounds. Then, when you’re ready to get up and about for your day, sink your teeth into Maldivian mas huni, a savoury smoked tuna, garnished with onion, coconut, and chili – perfect to get you going.